Let me take a moment to wish you a very Merry Christmas and extend my wishes for a safe and enjoyable holiday season with your family and friends. This is also the time of the year when the Christmas movies are seen almost daily on television. Like the movie that hit a nerve with me, the 1983 classic “A Christmas Story,” the tale of Ralphie and his quest for a Red Ryder BB gun. In truth – yours truly was an earlier version of Ralphie. There, it’s out in the open. I can remember shortly after making my wish known, hearing those disastrously horrible words – later repeated in the film. Yes, I wanted a Red Ryder BB gun for Christmas. So the movie awoke old feelings and made me realize if Hollywood thought the Red Ryder air gun and the words of Ralphie’s mother were common enough to use in their movie; maybe I hadn’t been alone in my Christmas wish. 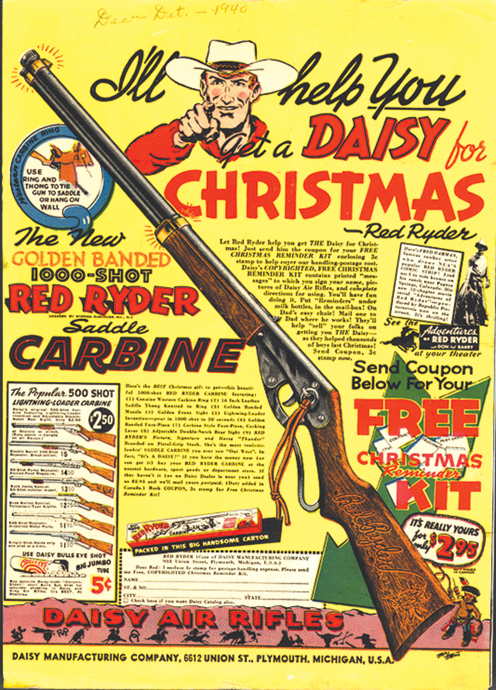 The Daisy Red Ryder remains one of America’s most memorable Christmas gifts. To many youngsters, it represents a rite of passage for adolescents. It was a gift of responsibility and growing up. Stephen Slesinger created the concept for the character Red Ryder in the mid to late 1930s. Slesinger’s presentation to Daisy hinged on the fact that by licensing the Red Ryder character and name, Daisy could have some control over the actions and personality of the character. Slesinger hired Fred Harmon to illustrate the comic strip. The strip was a big hit in newspapers and soon found its way into comic books and the movie serials. The Daisy Company got its beginning over 100 years ago, but it did not start off manufacturing air guns. Daisy actually began in Michigan in 1882 as Plymouth Iron Windmill Company, a manufacturer of windmills; however, by the late 1880s the windmill business was changing and the struggling company began looking for new ways to attract customers. The name stuck and the BB gun went into production as a premium item given to farmers when they purchased a windmill. The gun was such a huge success that Plymouth Iron Windmill soon began manufacturing the Daisy BB gun in place of windmills! On January 26, 1895 the company’s board of directors officially voted to change the name to the Daisy Manufacturing Company, Inc. The sturdy little Daisy BB gun quickly became a staple with American youth and youngsters all across the land cut their shooting teeth on a Daisy. Air gun competition was keen at the time, when other brands appeared almost overnight and disappeared just as quickly. Introduced in 1939, the Daisy Red Ryder has sold well over 10 million units, easily making it the most famous BB gun ever built. In 1958, Daisy moved their corporate offices and manufacturing facilities from Plymouth to Rogers, Arkansas, where the company has been now for over 40 years, selling guns in almost every country and on five continents. The air rifle is a great way for anyone to begin learning how to shoot and safely handle a rifle. Modern air rifles are well built and are excellent teaching tools and are fun for backyard target shooting practice. If a youngster can be started out handling an air rifle, then it will become a lifelong habit. So, if there are “Ralphies” out there that will be holding their breath until Christmas morning, my thoughts are with you. Only someone who has been where you are now could understand how you are feeling right now. But, just as Ralphie got his, I found my Red Ryder with a large red ribbon under my tree on that magic morning. The wonderful part of the whole thing is that more than a few decades later; I still have the use of both eyes. The sad part is that my old Red Ryder BB Gun was lost along with my collection of comic books and baseball cards.